Tired Hands Brewing Company in Ardmore. After months of speculation, Tired Hands Brewing Company has finally set up shop on Frankford Avenue, marking the Ardmore-based brewery's official entry into the city. 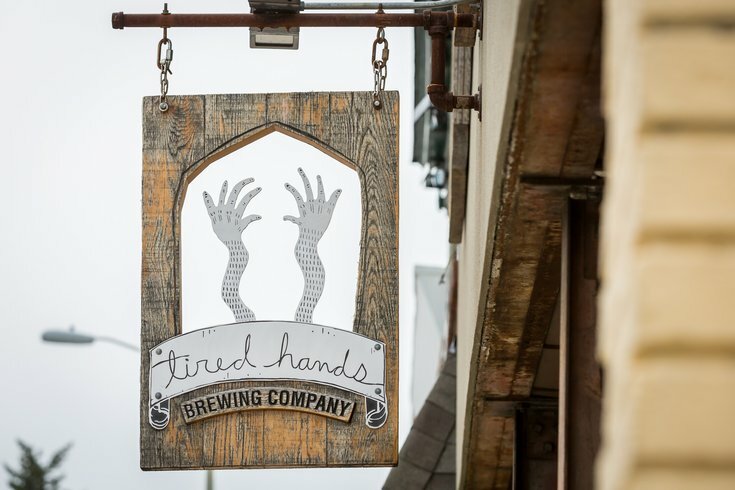 Rumblings of its beginnings popped up on Reddit late last week, and Friday night the Tired Hands Biergarten was open for business in a lot at 2213 Frankford Ave. in Kensington. Right now the new beer garden has an autumnal High Harvest theme, offering a curated selection of 13 Tired Hands beers served in 16-ounce plastic cups. Some beers will be available in cans, like the current Alien Church IPA option, the design of which is particularly appropriate this Halloween season. Other beer highlights include the brewery's signature SaisonHands, with palatable notes of guava and juicy fruit; and the dark mild ale Homespun Moon, which infuses Ethiopian coffee beans, toffee, and notes of cherry cola. Kombucha and bar snacks are also on the menu. The beer garden is open Wednesdays through Sundays. Wednesday through Friday it's open at 5 pm until 10 pm; weekends it opens at noon. Check out the full beer menu here.